This time, we head to the land of dragons and White Walkers through the neon early-’90s prism of “Saved by the Bell.” This is no mere mashup, though. A powerful U.S. Senate investigatory committee has launched a bipartisan probe into an American nonprofit’s funding of efforts to oust Israeli Prime Minister Benjamin Netanyahu after the Obama administration’s State Department gave the nonprofit taxpayer-funded grants, a source with knowledge of the panel’s activities told FoxNews.com. The fact that both Democratic and Republican sides of the Senate Permanent Subcommittee on Investigations have signed off on the probe could be seen as a rebuke to President Obama, who has had a well-documented adversarial relationship with the Israeli leader. The development comes as Netanyahu told Israel’s Channel Two television station this week that there were “governments” that wanted to help with the “Just Not Bibi” campaigning — Bibi being the Israeli leader’s nickname. It also follows a FoxNews.com report on claims the Obama administration has been meddling in the Israeli election on behalf of groups hostile to Netanyahu. A spokesperson for Sen. Rob Portman, Ohio Republican and chairman of the committee, declined comment, and aides to ranking Democratic Sen. Claire McCaskill, of Missouri, did not immediately return calls. The Senate subcommittee, which has subpoena power, is the Homeland Security and Governmental Affairs’ chief investigative body with jurisdiction over all branches of government operations and compliance with laws. More on this…What can repair the US-Israel rift? “The Permanent Subcommittee on Investigations does not comment on ongoing investigations,” Portman spokeswoman Caitlin Conant told Foxnews.com. But a source familiar with the matter confirmed for FoxNews.com that the probe — undisclosed until now — was both underway and bipartisan in nature. According to the source, the probe is looking into “funding” by OneVoice Movement – a Washington-based group that has received $350,000 in recent State Department grants, and until last November was headed by a veteran diplomat from the Clinton administrations. A subsidiary of OneVoice is the Israel-based Victory 15 campaign, itself guided by top operatives of Obama’s White House runs, which seeks to “replace the government” of Israel. “It’s confirmed that there is a bipartisan Permanent Subcommittee inquiry into OneVoice’s funding of V15,” the source said, speaking on condition of anonymity about the American group, which bills itself as working for a two-state solution to the Israeli-Palestinian conflict. He characterized the campaign against him as “unprecedented.” While Netanyahu pointed the finger at “European countries and left-wing people abroad,” some observers note that he held back from openly criticizing Obama during his recent trip to the U.S. to address Congress on problems his government sees with administration-backed efforts to reach a nuclear weapons inspection deal with Iran. 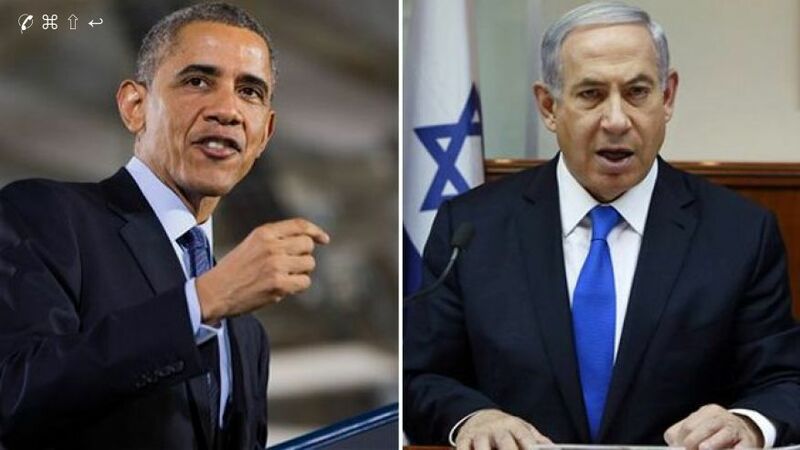 No direct link has been confirmed between Obama and the anti-Netanyahu campaign in Israel, but polls have shown that a large majority of Israelis believe the administration has been interfering in the election, set for March 17. One expert told FoxNews.com earlier this month the State Department grants constituted indirect administration funding of the anti-Netanyahu campaign by providing OneVoice with the $350,000 — even though State Department officials said the funding stopped in November, ahead of the announcement of the Israeli election. Gerald Steinberg, founder and president of NGO Monitor, which tracks money flows to unmask non-governmental organizations that deviate from their stated human rights or humanitarian agendas, said even ostensibly unrelated grants keep an organization going during periods it is not engaged in political activity. Indeed, by January, OneVoice – whose focus on Israel’s 1967 borders as a negotiating starting point reflects Obama’s thinking but is counter to Netanyahu’s – had announced its partnership with V15. Around the same time, Jeremy Bird, who served as Obama’s deputy national campaign director in 2008, and his national campaign director in 2012, arrived in Israel to help direct V15. Bird took with him additional former Obama campaign operatives to help V15 achieve its goal of knocking on one million doors to make the case for a change in Israel’s leadership. OneVoice is barred from directly targeting Netanyahu by U.S. law regulating its tax-exempt status, and doing so would threaten that status. One Voice spokesman Payton Knox denied claims the group is working with the administration in the upcoming Israeli election. But the recent FoxNews.com investigation showed that the nonprofit, in its 2014 Annual Report, said its Israel branch would be “embarking on a groundbreaking campaign around the Israeli elections.” In partnering with V15, the two groups have operated from adjacent offices in Tel Aviv. In addition to McCaskill, other Democrats on the subcommittee are Sens. Jon Tester of Montana, Tammy Baldwin of Wisconsin, and Heidi Heitkamp of North Dakota. Republican subcommittee members, who form the majority, are Sens. John McCain of Arizona, Rand Paul of Kentucky, James Lankford of Oklahoma, Kelly Ayotte of New Hampshire, and Ben Sasse of Nebraska, in addition to Portman. State Department documents say the grants to OneVoice were meant for the group’s work in encouraging both Palestinian grass-roots civic activism and Palestinian-Israeli peace talks. The State Department itself, meanwhile, denied any of the funds had been used for election campaign activities despite OneVoice’s backing of V15. Launched in 2002 by snack bar mogul Daniel Lubetzky and boasting the star power of such celebrities as Brad Pitt, Danny DeVito, Rhea Perlman and Sir Paul McCartney among its honorary advisors, OneVoice was headed until November by Marc Ginsberg, who advised President Carter on Middle East policy and served as President Clinton’s ambassador to Morocco. Ginsberg, who has described the administration’s approach to the Israeli-Palestinian conflict as a “window of opportunity,” is now serving OneVoice as “special advisor” after resigning as CEO at a time that turned out to be just ahead of the early December announcement of the Israeli election.